Boss, may I have your cellphone number? National Kidney Foundation (NKF) chief executive Edmund Kwok often asks his employees: "What is my number?" He wants to make sure they have his mobile phone number, and they do. All 700 staff at the voluntary welfare organisation know his number by heart and often send him text messages sharing their problems at work and at home. "Sometimes they text me to ask how am I doing. It is nice. It shows that we have a personal connection," said Mr Kwok. Staff attrition rate at NKF is 8.3 per cent, compared with the average attrition rate of 15 per cent in the health-care and social services sectors. In a tight labour market, bosses are finding that a personal touch is increasingly important for staff retention. Managing employees with a heart seems like a rudimentary concept, but it is often overlooked, as pressures on the bottom line pile up, say human resource (HR) experts. Mrs Joni Ong, who heads the Singapore office of global consulting and training company Great Place To Work, said her firm had done surveys of millions of workers worldwide. And these surveys revealed a consistent theme: Bosses who do extra to show that they care are more successful in forging staff loyalty. "It is important to focus on the employee as a person rather than as a means to an end," said Mrs Ong. To show staff they matter, some bosses, such as Mr Kwok, work alongside workers. He regularly accompanies nurses and logistics staff when they visit patients' homes to check on them and to deliver medicine. 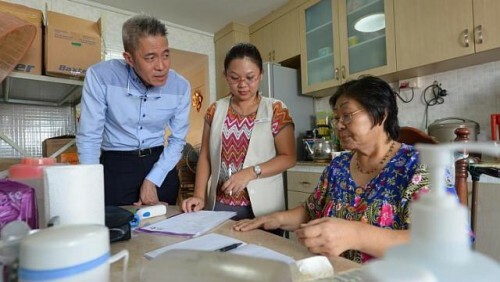 Every week, he visits two out of NKF's 25 dialysis centres to meet staff. Other firms find that simple gestures go a long way in boosting staff morale. Supervisors at IT company T-Systems, which has 120 employees, are encouraged to take staff out for meals and are sent for communication workshops to learn to connect with their staff better. Mr Brandon Lew, head of HR operations at T-Systems, said: "We find that heads of department who pay for meals and buy presents out of their own pockets have many staff who stay five years or more." Similarly, tour agency International Paradise Connexions (IPC) budgets $500 for managers to take their teams out for lunch when a female employee returns to work from maternity leave. It also gives staff toy and book vouchers to get gifts for their children. While building relationships is an important management strategy, Mr Brad Adams, head of HR research at business consultancy CEB, said it can be challenging for bosses to maintain a personal touch at all times. "The best companies go beyond just manager-led engagement tactics to leverage the power of peers and and broader organisational initiatives," he said. IPC boss Raj Kumar agrees. He gets senior staff to be buddies to newcomers. The seniors are trained to counsel their colleagues on work and personal issues. IPC sales manager Camy Ho, 29, who has a four-month-old boy, said her buddy, who is also a mother, gave her advice about juggling work and life. The colleague also helped cover her responsibilities when she had morning sickness and when she was away on maternity leave. "I have been with the company for eight years and I will stay on because my colleagues and bosses are like family," said Ms Ho.